Since Thanksgiving is all about giving thanks (go figure) and the December holidays are all about giving, this month I’m “giving” you a favorite “Thanks”giving dish of mine. If you don’t want to stray from your family traditions on Nov. 27, I completely understand, but since this is the season of parties and potlucks, feel free to bring it to impress your friends and coworkers. This recipe is sans marshmallows which is surprising to my family and maybe you too after last month’s column. My soup recipe this month is a feel good spin on the traditional potato and leek soup. I have perfected this over the years, originally starting with the basic recipe and adding bacon lardons (bacon from a whole slab that is diced, blanched, and fried), then adding the spinach, followedbythecurry,andfinallythe apple. I think it’s just about complete at this point and while there are a lot of different things going on in it, it’s the perfect heart and f lavorful winter soup. Make a batch of it, freeze it in individual servings, and take it for lunch; it’ll maintain its integrity for at least a month in the freezer. 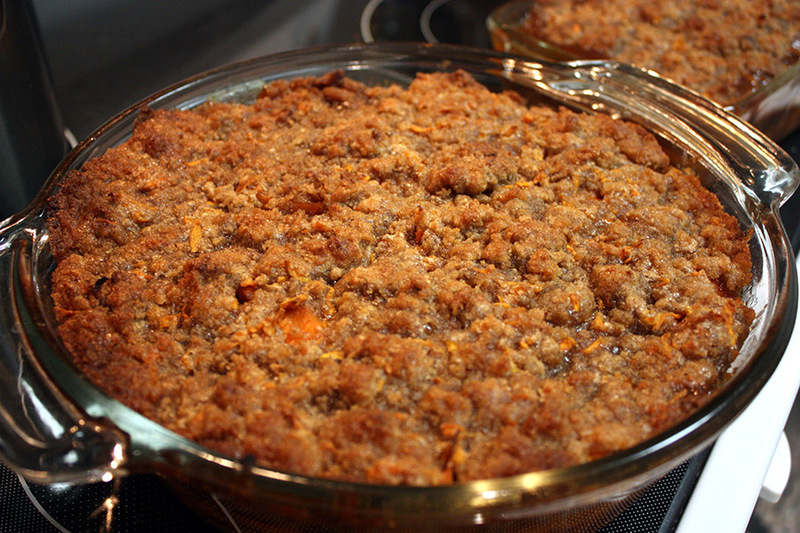 Sweet potato streusel is always a favorite at my house for Thanksgiving. Preheat oven to 375°F. Butter or grease 13x9x2-inch glass baking dish. Peel yams; cut 1 inch off ends. Coarsely grate enough of yam ends to measure 1/2 cup; set aside for streusel. Discard remaining ends. Cut remaining whole yams into 1/3-inch-thick rounds. Arrange yam rounds tightly in 4 overlapping lengthwise rows in baking dish. Bring 1/2 cup water, maple syrup, butter, and cider vinegar to boil in small saucepan. Stir in 1 teaspoon coarse salt and 3/4 teaspoon pepper. Pour maple syrup mixture over yams. Cover baking dish tightly with foil. Bake yams covered until almost tender, about 40 minutes. While yams are baking, mix first four ingredients in small bowl. Add melted butter and rub in with fingertips until moist clumps form. Mix in reserved 1/2 cup grated yams. Once yams are tender, increase oven temperature to 400°F. Sprinkle streusel over and bake uncovered until yams are very tender and streusel is golden and slightly crisp, about 35 minutes longer. Serve warm. 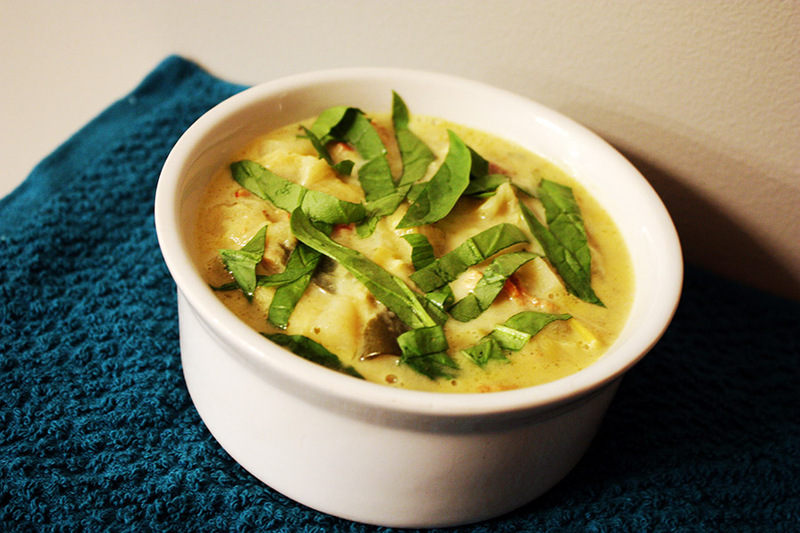 Curried potato, apple, and leek soup with spinach is one of the greatest cures to the winter cold blues; heat up a bowl, sit by the fire, and watch the snow fall for the perfect winter evening. Fry the bacon lardons until cooked throughout, set aside on a paper towel to remove excess grease. Halve leeks lengthwise and cut enough crosswise into 1/4-inch pieces (leeks are grown in the ground so there is usually A LOT of dirt in between the layers so be very careful and thorough when washing them; you may want to wash them once or twice after you chop them). Peel potatoes and cut into 1/4-inch pieces. In a 1 large saucepan or stockpot, cook leeks, potatoes, and apples in butter with curry powder over medium heat, and stir consistently for 5 minutes. Stir in chicken broth and simmer, uncovered for 20 minutes. While soup is cooking, chop spinach thinly. In a blender purée soup briefly, leaving it somewhat chunky (Be cautious blending hot liquids!) and return to pan. Add heavy cream and salt and pepper to taste and bring to a simmer. Remove pan from heat and stir in spinach.